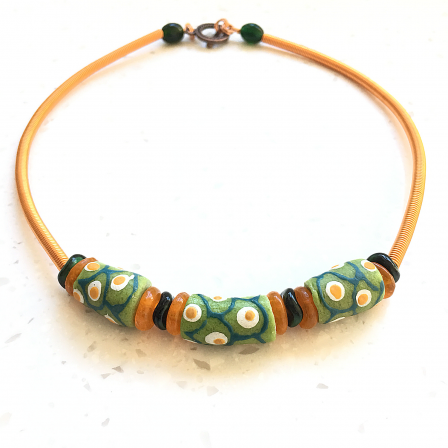 This contemporary necklace is made up of African batik bone beads, Ghana brass beads, Ghana powdered glass beads, permanent colour & non-tarnished high quality Artistic wire in natural copper and antique copper-plated metal findings. Length - 47 cm (18in). Customised length is available upon request. 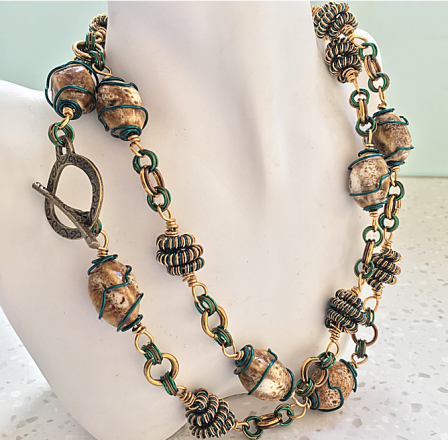 This contemporary necklace is made up of lampwork glass beads, Czech glass beads, permanent colour & non-tarnished high quality Artistic wire in antique brass and antique brass metal findings. Length - 44 cm (17in). Customised length is available upon request. 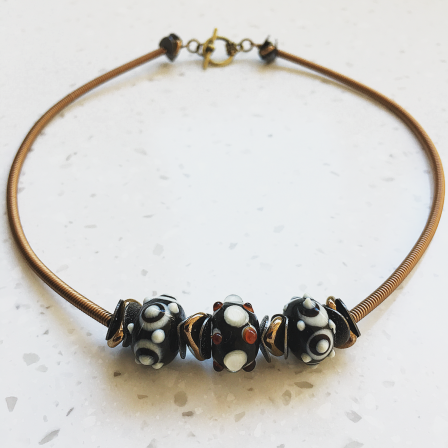 This contemporary necklace is made up of hand blown glass beads, Czech crystals, Czech glass beads, gun-metal spacers, permanent colour & non-tarnished high quality Artistic wire in rose gold and antique rose gold-plated metal findings. Length - 47 cm (18in). Customised length is available upon request. 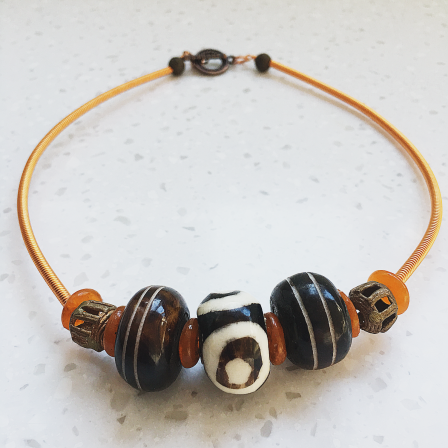 This contemporary necklace is made up of Ghana Krobo tribe powder glass beads, German vintage glass beads (navy blue), permanent colour & non-tarnished high quality Artistic wire in natural copper and antique copper-plated metal findings. Length - 47 cm (18in). Customised length is available upon request. 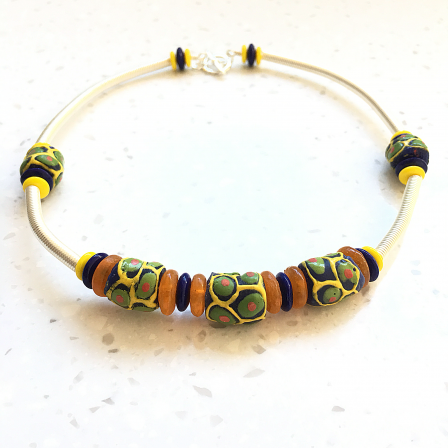 This contemporary necklace is made up of Ghana Krobo tribe powder glass beads, German vintage glass beads (navy blue), Czech glass beads (yellow), permanent colour & non-tarnished high quality Artistic wire and silver-plated metal findings. Length - 40cm (16in). Customised length is available upon request. 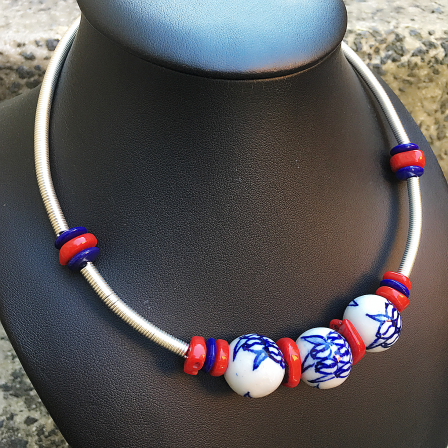 Contemporary choker style necklace is made up of handcrafted Artistic wire coils, 18mm diameter Chinese porcelain beads, genuine red coral beads and navy blue Czech glass beads. Artistic wire has great permanent colours in anti-tarnish finishes. Wire cord diameter - 4mm. 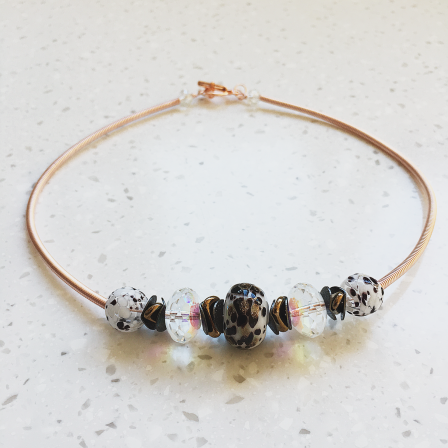 Necklace length - 40cm (16 inches). Customised length is available upon request. SOLD! 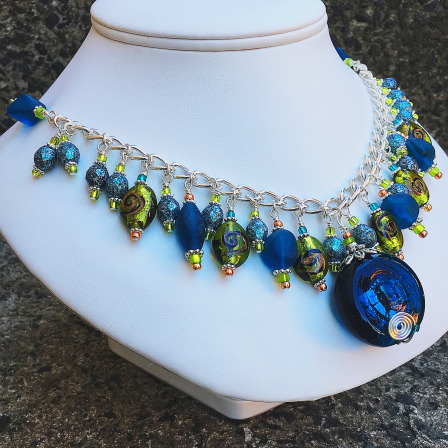 A fun and vibrant charm necklace, featuring silver-plated chain, embelished with Indian glass pendant with wire coil, green lamp-work glass beads, teal cultured sea glass and Czech fire-polished glass beads. Length - 50cm (19.75 inches). Length can be customised. 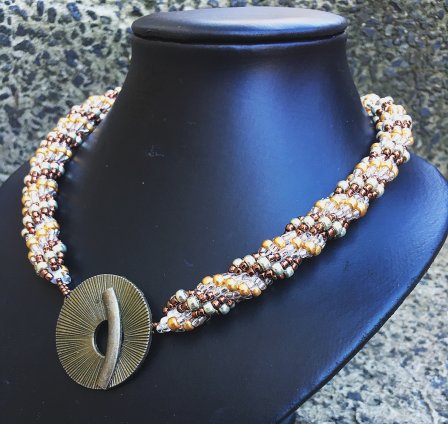 A classic necklace weaved with silver, gold and antique brass high quality Japanese Seed beads. Length - 50cm (19.5cm). Toggle size is 4cm in diameter which you could show off by wearing it in front as a pendant. 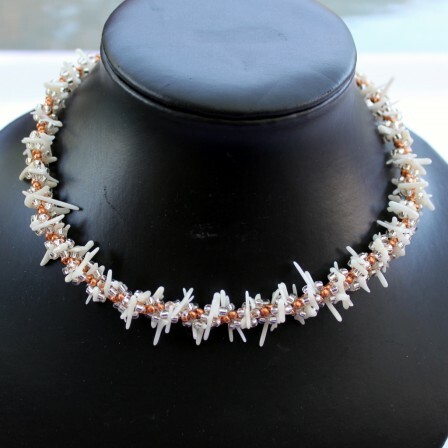 Stylish weaved spiral Necklace with white coral chips and high quality Japanese seed beads. Length - 41cm.